TOKYO, Feb, 21 2019 - (JCN Newswire) - Today Lexus announced its participation in the world's pinnacle design event--Milan Design Week(1)--for the 12th time. 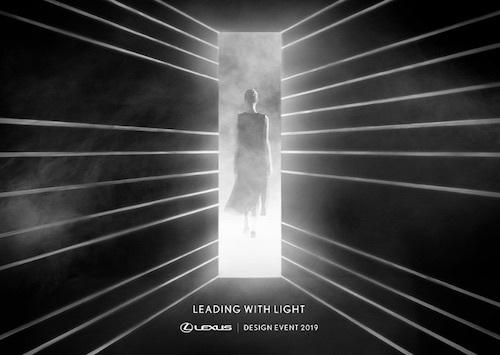 For more than a decade, the Lexus Design Event has provided visitors with an amazing experience in collaboration with some of the world's most celebrated designers who are inspired by Lexus design philosophy. For this year's event, titled "LEADING WITH LIGHT", Lexus has partnered with the globally renowned design firm Rhizomatiks, known for their rich experience in the field of design, art, entertainment and their imaginative use of technology to captivate audiences. Rhizomatiks has previously collaborated with Lexus in 2014 for the art and technology exhibition, Media Ambition Tokyo. Inspired by Lexus' future technology, Rhizomatiks has designed an immersive display that combines playful and dynamic lighting with advanced robotics. Visitors will experience how the innovative use of light can affect human emotions. Additionally, visitors will have the opportunity to view the works from the 6 Finalists of the 2019 Lexus Design Award--now in its 7th year. The award celebrates up and coming creative talent from around the world and on the Press Day of April 8, the Grand Prix winner will be chosen by a jury of world-renowned design leaders in front of the world's media. (1) The world's largest design exhibition, also known as Salone Del Mobile, presents events and exhibits by brands and designers in many categories including furniture, fashion and textiles. Established in 2006. A collective of creators and producers with rich personality and various backgrounds in areas such as media art and engineering. Rhizomatiks has previously handled numerous creative projects combining technical knowledge with high ability of expression. Collaborating with various notable artists such as Bjork, Rhizomatiks has created performances in numerous festivals such as Sonar Festival, MUTEK, and other festivals domestically and internationally. Since its debut in 1989, Lexus has earned a worldwide reputation for high-quality products and exemplary customer service. Lexus is the hybrid leader among luxury brands, offering hybrids that provide the best in innovative technology and premier luxury. The evolution of Lexus is reflected in the progressive designs of its new vehicles. The grille, dynamic light treatments, and sculptured lines create a distinctive look of luxury for Lexus. For more information, please visit www.lexus-int.com and www.lexus-int.com/news/.